The town of Wyong did not exist until 100 years after the first settlement of the colony of New South Wales in 1788. The event responsible for the establishment of Wyong was the coming of the railway in 1888 which linked Sydney with Newcastle. Many of the people employed in building this line stayed at Wyong where there was a construction camp, particularly for the bridge required to cross the Wyong River and the railway station. Much of the timber required for the sleepers, the culverts, the bridges, the fences and the buildings was obtained locally. From 1888 for 40 years until 1928 the town of Wyong and its surrounding district had a phenomenal growth rate. It became a solid and prosperous area. The coming of railway transport had at long last made possible the economic exploration of the timber wealth of the Wyong River and its tributaries. For the 20 years from 1888 until 1908 the local timber industry was phenomenally active. When the timber stands were depleted the timber getters moved on to new stands elsewhere leaving the cleared land to the next generation of pioneers who grew crops, planted orchards and established herds and dairies. By 1908 these other diversifying activities, including the fishing industry, were established and had become major factors in the local scene. The district was no longer based primarily on a timber economy. From 1888 for 40 years until 1928 the Town of Wyong and its surrounding district had a phenomenal growth rate. In many respects the period of greatest activity and greatest prosperity in the first fifty years of the town of Wyong was the period from 1906 -1918. The year 1906 had seen the formation of the Erina Shire and by 1907 the Dairy Co-operative Factory had been established and the change from a timber economy to a more settled agricultural and farming economy was well advanced. 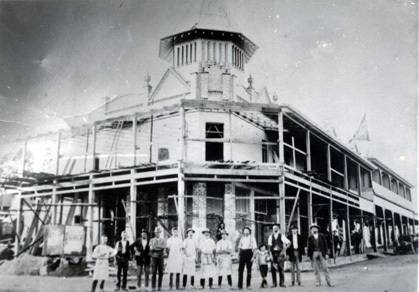 In this period came the building of the churches, the schools, the convent and the Wyong Literary Institute which became the meeting place, the cultural centre and the hub of civic and community matters in early Wyong. The Lending Library was the major activity of the Institute but other activities were its use as a Boys Club; a billiard room, and a hall which was used for many other community matters. It was also the local picture theatre. The local branch of the Returned Soldiers Association used the hall as did many other groups such as The Red Cross; The Grand United Order of Oddfellows; The Methodist Church; The Agricultural Association and the Department of Justice. The Wyong Shire was established in 1947, having previously been part of the Erina Shire. It covers an area of some 826 square kilometres and is situated between Sydney and Newcastle. It is bounded by the Pacific Ocean to the east, the City of Lake Macquarie in the north, the City of Cessnock to the north-west and the City of Gosford to the south and south west. Much of its population is centred around the three large lakes, known as the Tuggerah Lakes, that form the ‘jewel in the crown’ of the Shire. The valleys to the west are home to the Wyong, Ourimbah and Olney State Forests. Several small villages, hobby and turf farms can also be found to the west of the Tuggerah Lakes. Poultry farming became a major industry after the decline of the citrus and dairy industries. Market gardening, coal-mining and power stations which at one time were also prominent features of the local economy have now also given way to a community based on small industry, retail and service industries and tourism. With excellent transport links to Sydney and Newcastle many residents commute to these cities for work and enjoy the relaxed lifestyle of the shire at weekends. Excellent surf beaches and recreational fishing attract many weekend visitors and holidaymakers. The shire is also home to a large retired population. The town of Wyong today is the administrative hub for the shire and is also developing itself into a cultural centre. Norah Head Lighthouse, Alison Homestead, Chapman’s Store, The Tuggerah Pioneer Dairy, The Old Wyong Primary School and St Barnabas’ Church at Yarramalong are some of the important historical buildings within the shire.